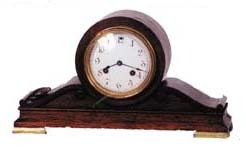 Waterbury Clock Co. tambour "Blenheim", ca 1915. Mahogany case is 14 3/4inches wide, 8 inches high, metal feet, cast gilt sash and bezel. 4 1/2inch porcelain dial, beveled and convex glass. Full label on the base. There is a fancy brass back, but missing a door. Brass gong stand, movement with rack and snail count. A little cleaning should be all that is needed. Ly-Waterbury No.1381.